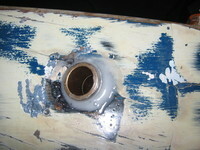 *PRICE DROP* 1550$ for the complete boat minus runners, or 450$ for the hull, plank, mast, sail, minus the DN hardware. My son is too old for this boat now, and he has been hogging all my DN time, The Opti I built for him in 2008 is for sale. Nice boat that sails beautifully, Natural Cedar sided finish with a painted deck and plank. Fully rigged with brand new Sarns hardware. Quantum opti sail and spare original opti sail. (works great in sticky conditions). 2000$ without blades (Available), Also available with out most of the hardware at a reduced price because I plan on building another DN, Trades considered. 65 one-3 zero 3/ 0 nine 0 seven.